Â Â Â - Durable and lightweight die cast aluminium body. Â Â Â - High-quality, spare parts are data processing, high accuracy. Â Â Â - Convenient one hand operation with safety trigger for easy and safety start. Â Â Â - Compact, lightweight design for easy maneuverability. Â Â Â - Good choice for smoothing sharp edges, deburring,polishing and grinding. Â Â Â - Professional grinder kit giving complete flexibility for most grinding and polishing needs. Â Â Â - Quick chuck design, chuck can be quickly converted between 3mm-6mm. 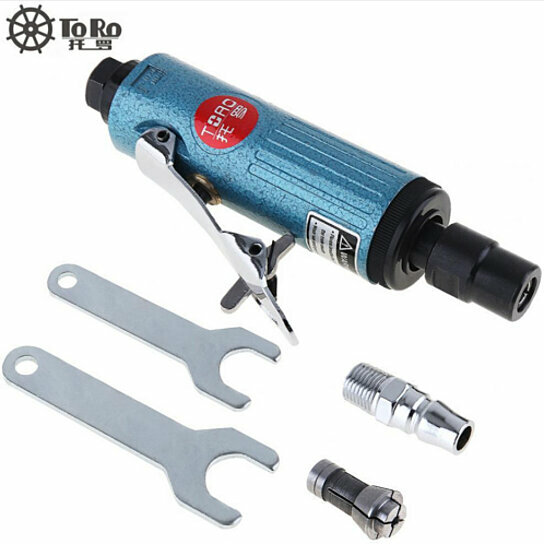 Â Â Â - High speed, small ornaments, grinding speed, to prevent sudden start, easy to operate. Â Â Â - It is widely used in all kinds of mold, hardware products, and glass, stone, handicrafts, ornaments, circuit board manufacturing and so on industry need blank shaping, cutting, grinding and finishing homework. Â Â Â - 1. Please give oil 3-5 times a day, the method of oil is injected from the inlet 0.5CC oil, let the tool idling 3-5 seconds. Â Â Â - 2. Oil types: Please use # 15 pneumatic tools for oil. Â Â Â - 3. Impact Wrench In addition to the above oil, the combat department about once in five months, the strike department removed parts, the old butter wipe clean, cast a amount of butter to be appropriate (about 10-15CC) If you add too much butter, will lead to torque worse.